Wednesday Vignette - real frost! We've had weeks of dark, cold, rainy days, with night-time temperatures hitting the mid-to-high 30s. Suddenly, it's become sunny and about 5 degrees colder overnight. 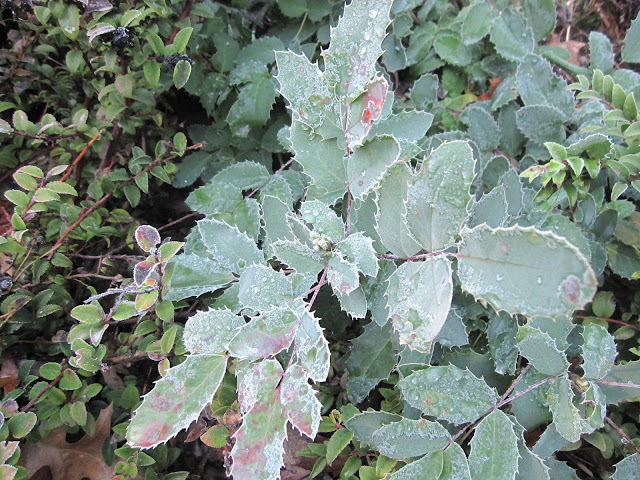 And for the first time this winter, frost appeared in my garden. 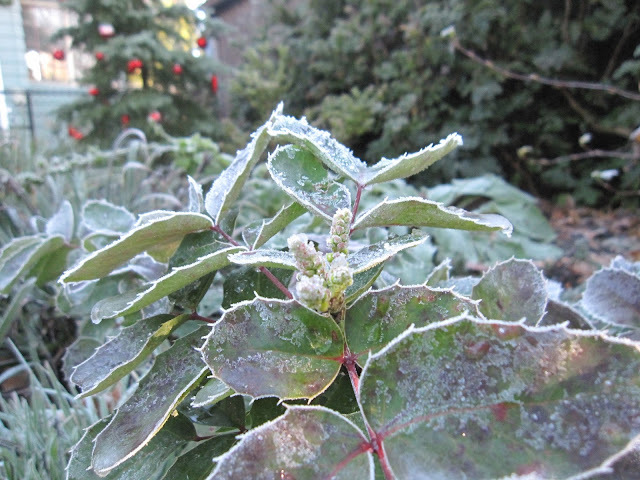 For Anna's Wednesday Vignette over at Flutter and Hum, here are a couple of Mahonia repens modeling this morning's frost quite attractively, I think. Just visible in the background above is our Western Hemlock (Tsuga mertensiana) still decorated for the holiday season. In that vein, I wish each of you a very happy New Year, and a bright and fulfilling 2016! I was coming back into the house when I saw all the greens the Mulch Man had cut for me to use in the house. 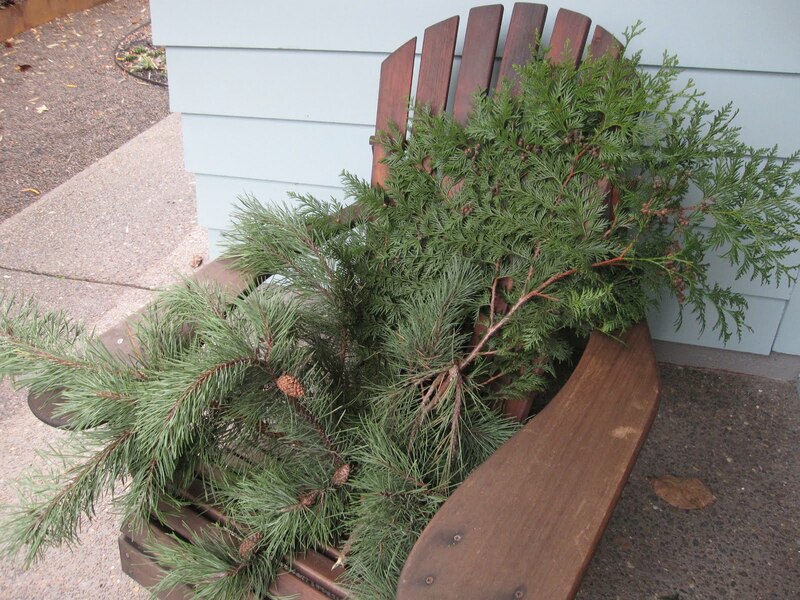 Although they had been artlessly tossed on an outdoor chair awaiting my needs, they managed to look perfectly arranged. 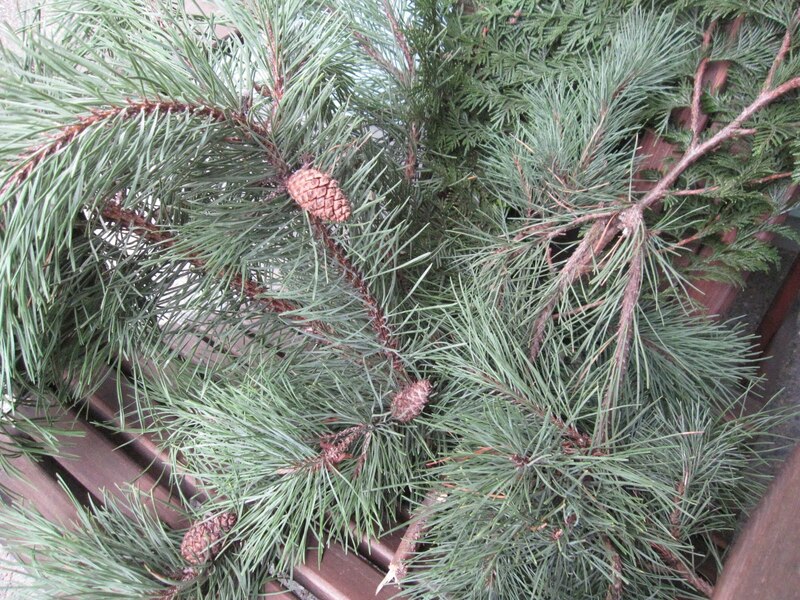 I love decorating my ancient aluminum tree for the holidays, but I couldn't do without the scent of pine and cedar in the house, too. Especially here in the Pacific Northwest, here's just something special about real greens during the holiday season, don't you think? I'm joining with Anna at Flutter and Hum to celebrate Wednesday Vignette. Check out the links to other delightful vignettes you'll find in the comments. Here we are at the midpoint of the month again. 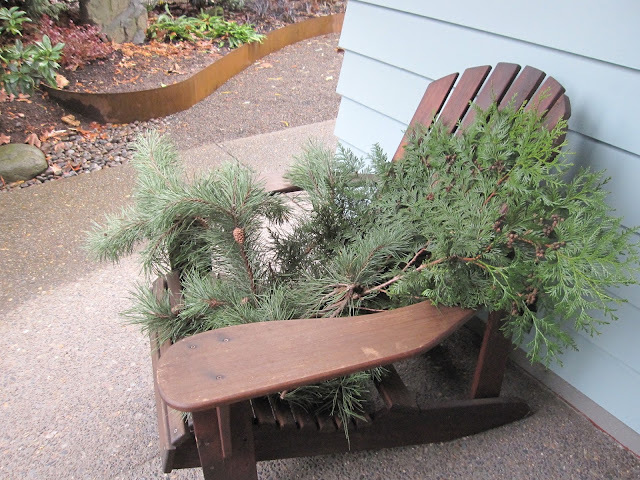 Since last month's Bloom Day, we've had rain to the point of flooding, and high winds as well. 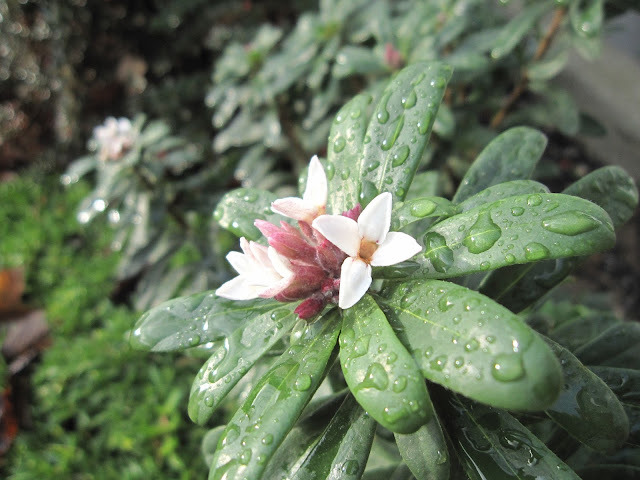 But as I walked around my waterlogged garden, I was struck by how long-lasting several of last month's bloomers were in spite of the challenging weather they'd endured. In fact, some of the flowers I'll show you today are the actual blooms I showed last month. Case in point: this Daphne x transatlantica 'Eternal Fragrance' - this is the exact flower cluster I pictured in mid-November, still in bloom. 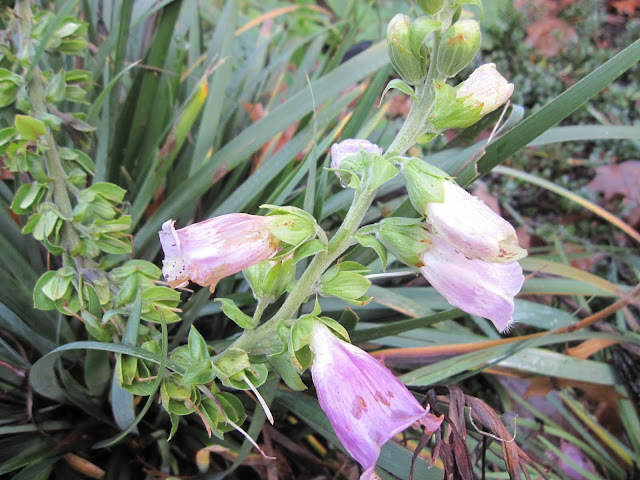 Remember this lone Digitalis purpurea bloom from last month? It's a little ragged, but still flowering through our downpours. 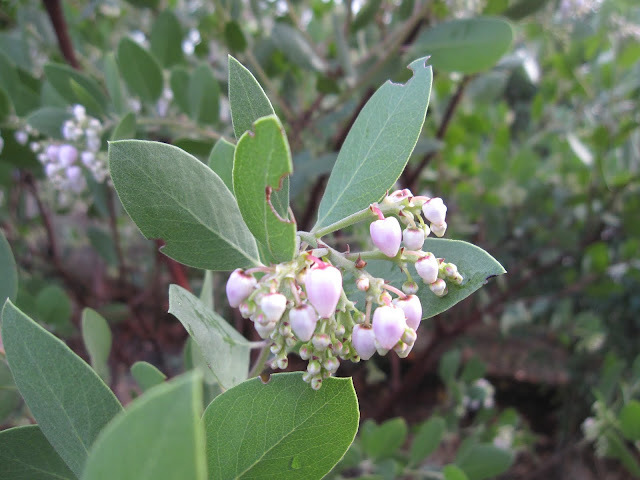 A hungry hummingbird led me to discover that Arctostaphylos 'Austin Griffiths' flowers are opening all over the plant. 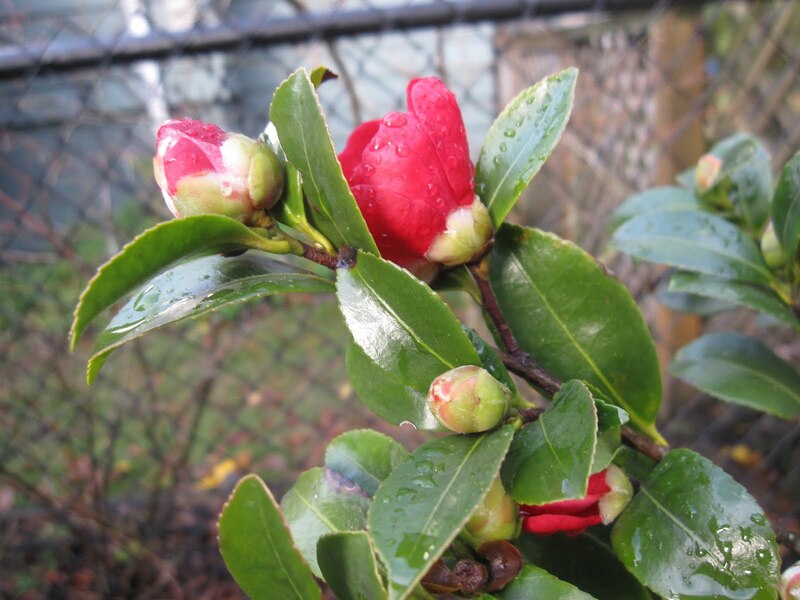 And these blooms are early - last year at this time the buds were still tightly closed. 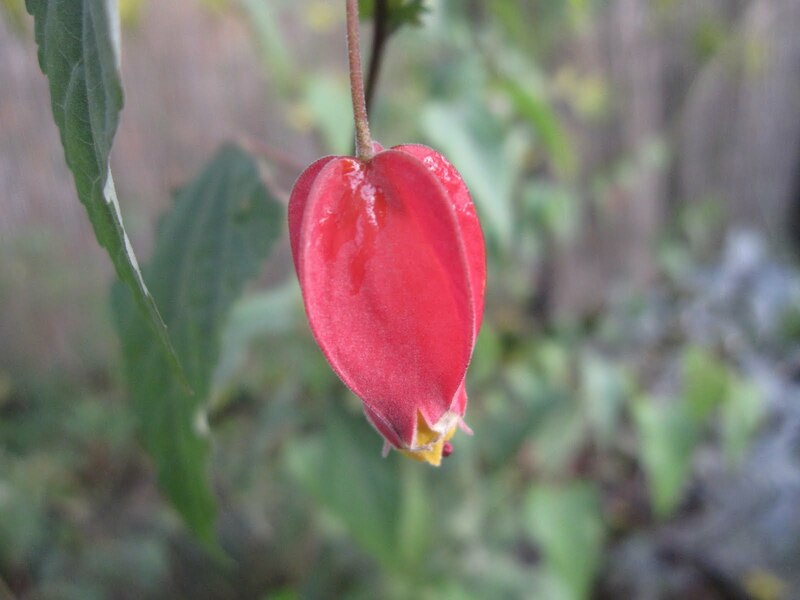 Abutilon megapotamicum is another of last month's bloomers that just keeps eking out a few more flowers - or are these the same ones, miraculously preserved by our cool, wet month? 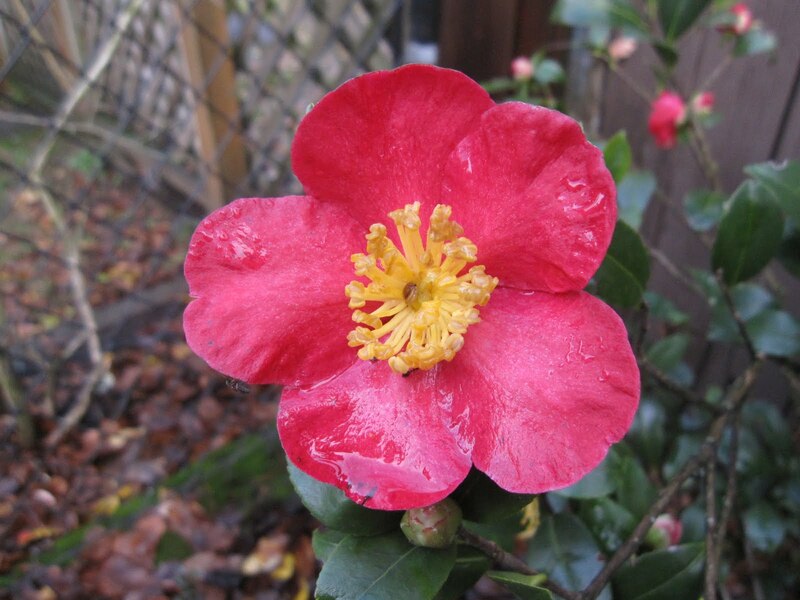 It's really no surprise that the Rosemaries are still blooming from last month: this is their time to shine. 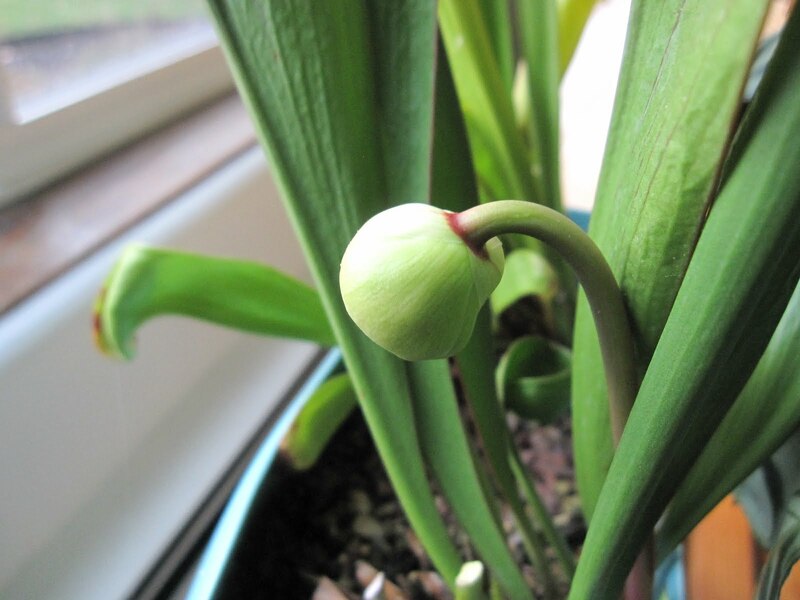 Indoors (and I'm anticipating here) a bud is developing in a pot of Sarracenia. 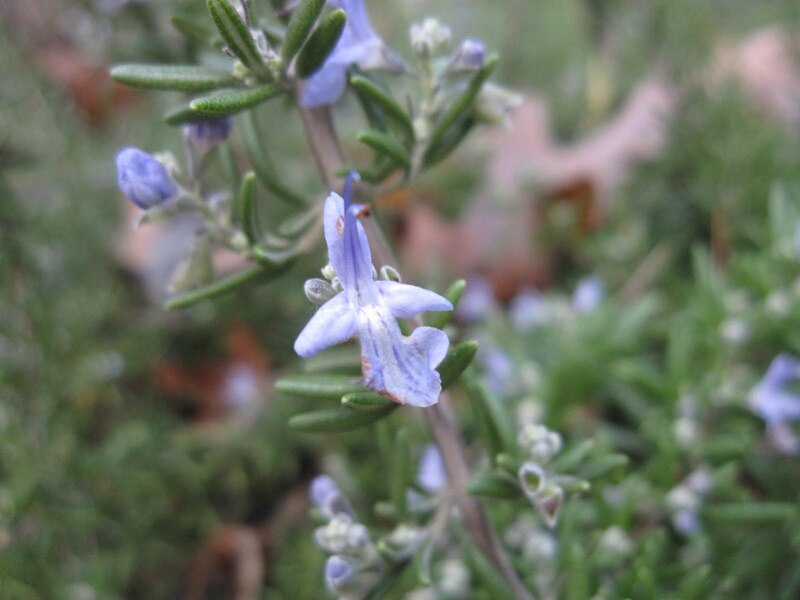 The flower will likely be brown and unspectacular, but it's always fun to see a plant bloom for the first time. 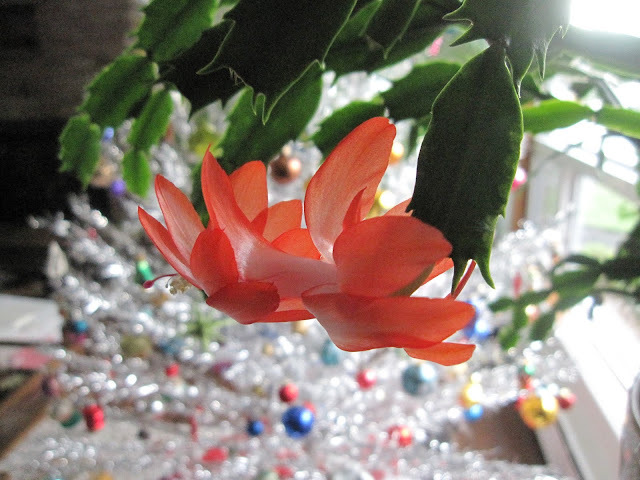 In the spirit of the season, a Schlumbergera bridgessii or Christmas Cactus, is putting out a few bright blooms. 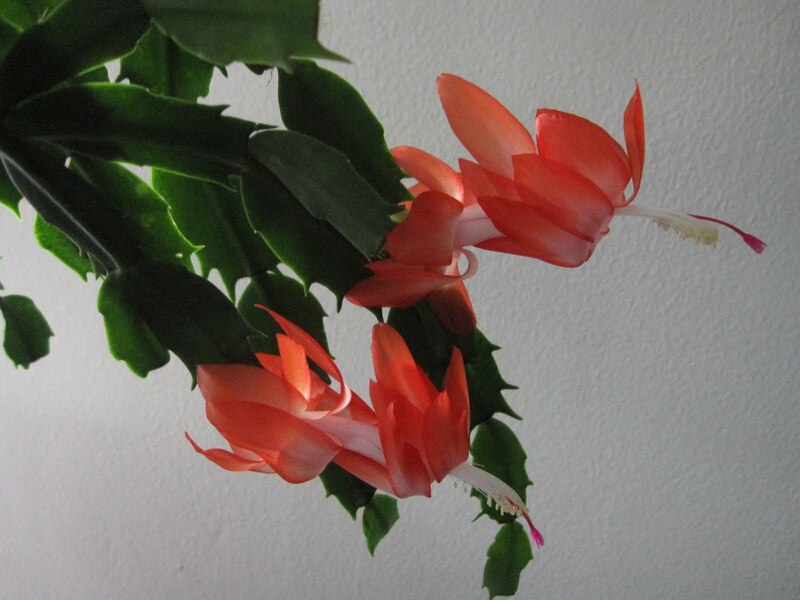 This one used to bloom at Halloween (making it a Halloween Cactus?) until an unfortunate accident involving a very bad cat apparently shook up its flowering time. The blooms looks even more festive with the backing of my mid-century aluminum Christmas tree. 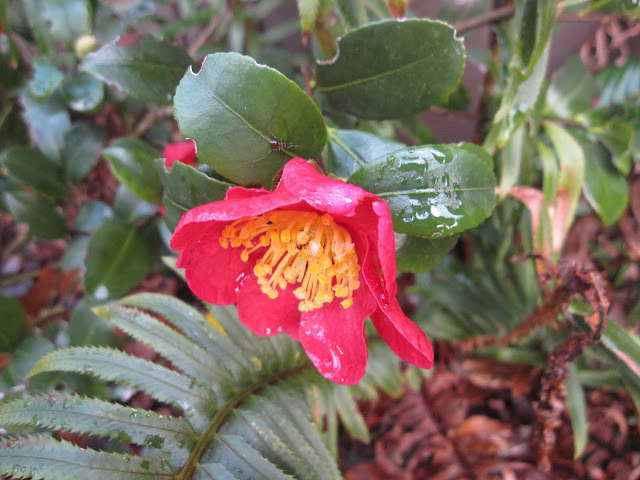 Let's go back outside for the finale: Camellia sasanqua 'Yuletide' is doing its best to brighten up the back garden in Christmas color. I'm especially glad to see these flowers since the summer heat was hard on the three plants we have in this corner: One may need to come out and only this one has produced any buds or blooms. It's a lovely, bright note in a soggy space. 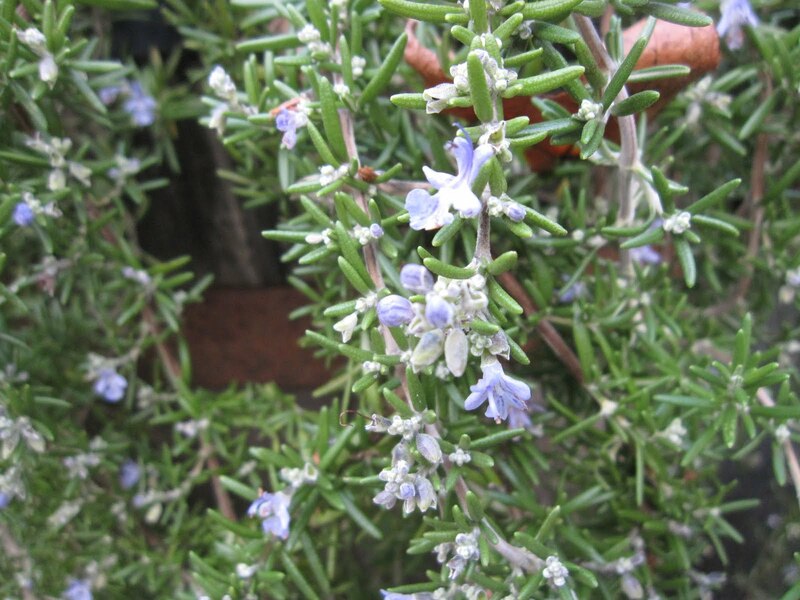 I'm joining May Dreams Gardens to celebrate Bloom Day. Check out Carol's post there for lots of other December blooms from all over.